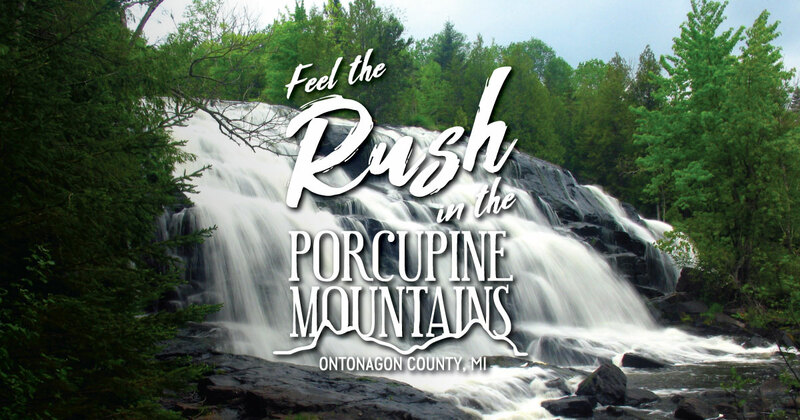 An unforgettable way to experience fall beauty in the Porcupine Mountains and Ontonagon County is to take a drive to explore some of the region’s wild waterfalls. During the fall, these cascades are framed by spectacular fall color and free from early-season crowds. Here are three waterfalls to visit on your next fall color tour. Looking for a place to stay? Discover welcoming lodging properties in the Porcupine Mountains and Ontonagon County. This gem of a waterfall is considered of the most scenic falls in the Upper Peninsula. It’s located on the middle branch of the Ontonagon River and is easy to reach by car (there’s even a roadside parking area). The falls are located off Highway 28, about seven miles southeast of Bruce Crossing. These iconic falls are among the most photographed in the Midwest. You’ll find the falls about an hour south of the Porcupine Mountains near Paulding. Located on the middle branch of the Ontonagon River, Bond Falls has a total drop of about 50 feet over a wide swath of rock, which creates a delicate series of rushing cascades. These picturesque falls are located on the western side of the Porcupine Mountains Wilderness State Park. The falls consists of three beautiful cascades—Manabezho, Manido and Nawadaha falls. Park at the Presque Isle Scenic Area and stroll to the falls along the scenic Presque Isle River.